The primary focus of this research study was to examine the benefit of a using a multimodal approach to speech sound correction with preschool children. The approach uses the auditory, tactile, and kinesthetic modalities and includes a unique, interactive visual focus that attempts to provide a visual representation of a phonemic category. The research compared the effectiveness of traditional articulation therapy with this multimodal approach to articulation therapy for each of two 4-year-old children. Participants demonstrated severe articulation deficiencies in the presence of two very different receptive-expressive language profiles. The findings indicated that the multimodal intervention not only directly improved both participants’ articulation abilities, but also enhanced their developing phonemic awareness and literacy skills. The analysis suggests that early speech sound intervention using a multimodal approach that emphasizes symbols may be more beneficial than a traditional articulation therapy approach for some children, because it promotes phonemic awareness and sound–symbol correspondence. Our research continues with children and adults. "Three years ago, our district was awarded an early education literacy grant from the federal government. It is called Project LLEAPS (Language Literacy Early intervention And Parent Support). My class has been one of the classes involved in this project, which allows for independent evaluators to assess each student at the beginning, middle and end of each school year. The first year we did not use FONEMZ and my scores were commensurate with the rest of the 11 classes who were also involved in the project. At the start of the second year our class was assessed by the evaluators and our overall results were commensurate with those we had received at the beginning of the previous year. Then we started using FONEMZ. This is an interactive tool that uses a different color and shape to represent each of the 40 main phonemes in English. The particular type of FONEMZ we used, were made out of felt. Never before have I used a teaching tool that could so totally develop phonemic awareness and literacy skills with preschoolers like the program FONEMZ! Because of its interactive nature and peer involvement it has the added component of being fun. 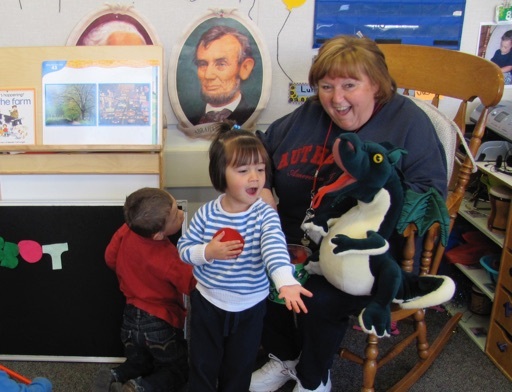 For the past 34 years I have taught children ages 2 to 5 years old in Head Start and State Preschool programs. Language and Literacy development have always been a huge part of my program. The children were introduced to FONEMZ, with our speech pathologist coming for a 30 minutes session for our first week. Some of the students (primarily English Language Learners) had not spoken in the class at all before this first day. Students were assigned partners and taught how to practice quietly sharing verbally with the person next to them. A child was chosen to come up and pick one of the FONEMZ out of a bucket. The child then shared the name of the FONEM with the group and then this was shared between neighbors. The child in front then told the name of this FONEM to a puppet and the puppet ate it. After a gleeful response the child was given back the FONEM and instructed to place it on a felt board for all to see. The children were instructed on how to use a pointing finger pointed toward the ceiling. This is the “ready” posture. When the FONEM was pronounced again, all the children pointed to it. This procedure was repeated with various students conducting the class until 4 of the FONEMZ were introduced and matched with like FONEMZ. The whole class pointed out the specific FONEMZ at regular intervals. All the children were motivated to participate and anxious to feed the puppet. Even the children who had never spoken before were labeling the sounds. I set up "play" stations that allowed the children use the puppet to explore the new sound(s) that were introduced each week. Within weeks the children were beginning to "build" simple words with the FONEMZ and they began making their own silly words. Toward the end of the year we were beginning to associate letters with the FONEMZ and "spelling" words, which they subsequently read. At this point we could announce, "You are readers! ", and watch their proud expressions when they knew this to be true. The children were able to build simple words using FONEMZ and now they were required to label the letters that were associated with them in spelling words. Apparently this was an additional incentive to learn the names of the letters and we observed that alphabet recognition also increased. At the end of the school year, when the independent assessment team again tested the children for LLEAPS, my students scored significantly higher than any other LLEAPS class in the district. Many of the children got 100% on Beginning Sound recognition and Alphabet Recognition. This year the results from the assessment team indicate that the children who were three last year and had been part of the FONEMZ training last year are testing at much higher levels than scores from previous years. Beginning Sound scores at the beginning of the year were extremely low (average of 4 out of 19). This year, my now 4-year-olds who began as 3 year olds, all got 19 out of 19 correct. I was not surprised. They not only identify beginning sounds, but also break words up into individual sounds. I know the difference is the FONEMZ program. On Nov. 4, 2010, I had a visit from a former student who is in Kindergarten this year. She wanted to show me her Academic Award that she received for Reading! This year three more of my students received awards for outstanding performance in reading. One little kindergardener is already reading at the second grade level. Again I attribute her success to her participation in FONEMZ! I am excited to be involved with FONEMZ again this year because I have seen first hand how effective it is with the children."